Up until now Intel (INTC) hasn’t unveiled which PCI Express spec its upcoming LGA-1155 Ivy Bridge processors will support, but their latest roadmaps includes an update which reveals support for PCI Express 3.0, even though it’s a feature that’s not even highlighted on the slide. 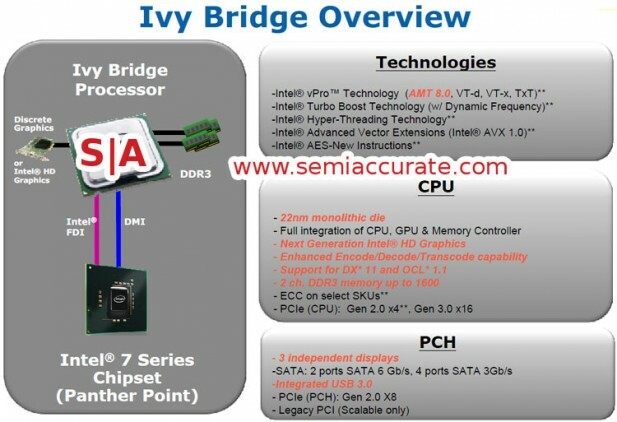 Keep in mind that this is a generic Ivy Bridge overview and not specific to a certain product SKU, but it looks like all CPUs top to bottom will get PCI Express 3.0 support. Beyond PCI Express 3.0 the big news of Ivy Bridge is, of course, that it will be Intel’s first 22nm production CPU, other than the memory news, that is. We’ll see yet another new graphics core which will apparently bring support for DirectX 11 and OpenCL 1.1 as well as improved video encode, decode and transcode support. We can also expect support for faster memory, although as always, Intel is being very conservative and only moves on to DDR3 1600MHz which seems to be a small step forward considering the platform is still almost a year away. The slide also verifies that the Panther Point chipset will be called the Intel 7 series, although exact chipset models may or may not follow the current numbering scheme, especially when you take the Z68 chipset into consideration, as this is a new addition to Intel’s otherwise somewhat predictable chipset numbering scheme. Chipsets with display connectivity will gain support for a third display, as the current 6 series chipsets are “limited” to two displays. SATA support appears to stay the same with a mere two SATA 6Gbps which is disappointing considering that AMD has had full SATA 6Gbps support for quite some time now. The 7 series is of course Intel’s first chipset to gain native USB 3.0 support as well and as far as we know, nothing has changed here and we’ll see support for four USB 3.0 ports, although this might very well differ between the various chipset SKUs. Sadly it looks like Intel decided to stay with DMI 2.0 and as such there won’t be any additional bandwidth available for the PCH, something that might become an issue with an integrated USB 3.0 host controller, SATA 6Gbps and additional peripheral controllers.